How long can the good times roll? The second-longest yet arguably most-hated bull market in post-war history just grinds on and on, while investors get more worried by the day. Valuations in some areas are certainly becoming stretched, but overall they remain some way off the peaks seen in 2000. Fundamentally, we are still in the goldilocks low-growth, low-inflation environment that has provided a benign backdrop to markets for some time. The uneasy imperative for investors then is to be ‘braver for longer’. The caveat is to do so while introducing incremental steps to manage downside risk. We have travelled a long way in this bull market and some of the drivers that have sustained it are beginning to look played out. Yet, history suggests the current situation could run on for some time. An early market exit runs the risk that a lot of potential return is left on the table. Global growth is still solid, while earnings growth is also supportive. Dividend yields on the S&P500 are in excess of 10-year treasury yields, so there is still relative valuation support for stocks. Source: Fidelity Earnings Forecasts, Fidelity International, September 2017. 2. The central bank dilemma: cyclical or structural? Central banks have a difficult job to do in separating cyclical and structural drivers at present. The key question to answer is whether we are seeing a sustainable recovery or simply a cyclical pick-up within a secular stagnation environment? In our view, the current cyclical uplift is not enough to justify meaningfully higher yields, with structural issues such as debt overhang, ageing populations and low productivity giving investors and central bankers plenty of reasons to expect growth and inflation to stay low for some time. Given low unemployment levels, we could have expected inflationary pressures from higher wages, but this is not happening. The implication is that the US economy is not as strong as the headline employment numbers would superficially suggest. 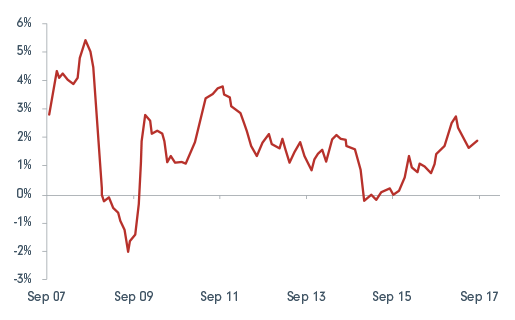 US inflation has been unusually weak for a streak of six consecutive months. Chair Yellen believes the inflation weakness will be temporary - despite cutting the Fed’s own inflation forecasts. The Fed projections still indicate a rate rise in December and three ‘data dependent’ rises in 2018. Further weakness in inflation numbers would raise questions about the true state of the US economy, so US inflation data is the one to watch. The S&P500 has been hovering around the 2400 range for the last few months. It is still possible to make a case for the market getting to 2700. We cannot expect further expansion of valuation multiples, but we are seeing double-digit earnings growth. Based on current outlook for earnings, we could see total returns of c.5-6%. For this to be attractive though, volatility needs to stay low. 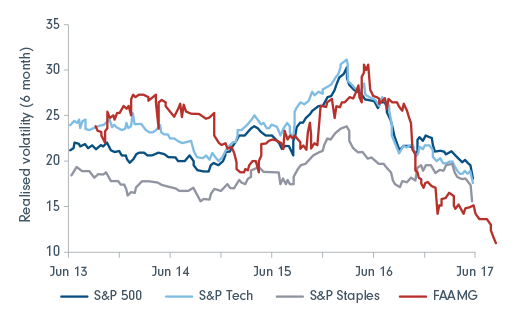 The narrow focus on technology means that a handful of large stocks have driven much of the market’s gains this year. The FAAMGs* have shown lower implied volatility than the market and even consumer staples stocks. This means these stocks are being bought for their defensiveness and their ability to beat earnings targets based on their dominant market positions. This is quite a different dynamic from the 1990s tech boom where we saw a more pronounced desire for speculative gains. FAAMG - growth stocks and safe stocks? The Fed left interest rates unchanged at its September meeting, but indicated one more hike may be likely in the fourth quarter despite subdued inflation. Markets now expect a hike in December, but it remains to be seen whether we will see three ‘data dependent’ hikes in 2018. Inflation data will be critical in this regard - it is now the key metric governing rate decision-making - and we think the Fed might be forced to err on the side of caution, keeping a cap on yields. The well-telegraphed process of shrinking the Fed’s balance sheet will kick off in October. In Europe, the key decisions around QE composition and the timeline for tapering were pushed back to the October meeting, so policy normalisation in Europe still appears some way off and tapering is now unlikely until at least 2018. Forecast source: Fidelity International, Bloomberg, 25 September 2017. The above forecasts are market-implied. 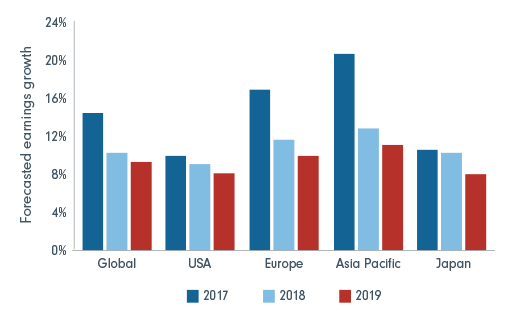 Physical real estate remains an attractive investment - the unexpectedly strong and synchronised upturn in Europe will support the commercial real estate market. A focus on core plus/value add is our strategy of choice on the continent, while a focus on the security of lease and tenure ought to offer outperformance in the UK. Within commodities, short-term oil fundamentals look positive. The uptick in the US rig count has stalled and inventory falls are running stronger than their seasonal patterns. In the medium term, however, higher oil prices will ultimately incentivise US shale production. Infrastructure valuations are stretched, but the asset class remains useful for its diversifying, uncorrelated returns. 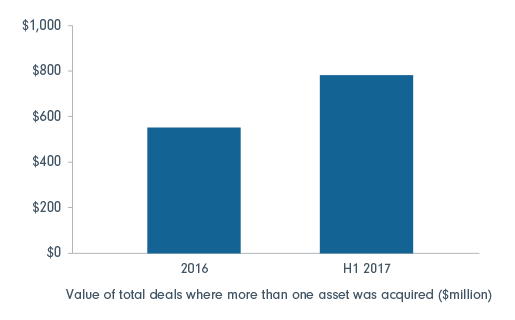 We like the renewables sector where M&A has picked up strongly; this tends to be higher-yielding and involve less project leverage than other infrastructure investments. Source: Top: IJ Global, July 2017.